This pedal produces a distortion that is known from the heavy metal music of the eighties. The "COLOR MIX" tone control is very sensitive and the DIST got a lot of punch. It's a great pedal if you want the 80s Marshall sound without actually using a Marshall amp. An oddity with the HM-2 is that the Dist knob doesn't actually change the sound betweeen 3 and 8 (assuming 0-10 scale). When you start turning up the dist knob you will hear the amount of distortion increase until the button is around 3. Then the level of distortion remains the same until you get to 8 and then it starts increasing again. The production moved to Taiwan 1988. The early Taiwan made HM-2s may have 6 digit serial numbers starting with a 0. If you enter this serial number into the decoder it will probably say 1981 while it should really say 1988. 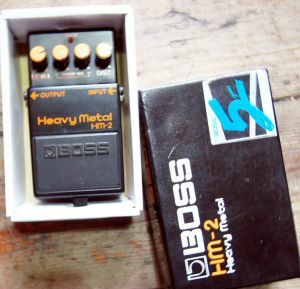 The HM-2 was sold from October 1983 to October 1991.